Doc's All-American. Photos by Kerry Saretsky. 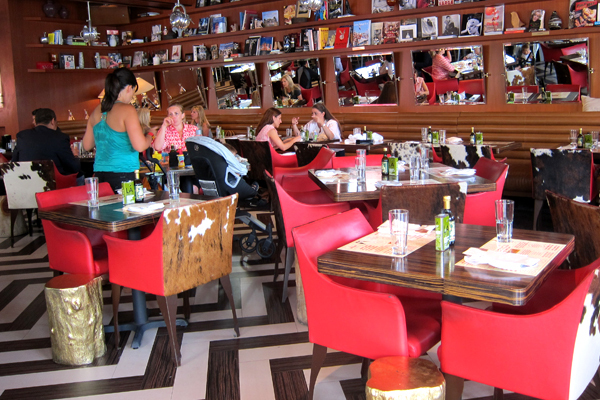 Just north of Miami and Boca is a Southern-minded town that's good for a meal. Local girl and Gentedimontagna contributor Kerry Saretsy knows what's best on the menu. DELRAY BEACH, Florida – Delray Beach may be the only old somewhat-Southern town in South Florida, but it's quickly, after many quaint, beautiful, and sleepy years, becoming an up-and-coming beachy hotspot. The main drag, Atlantic Avenue, stretches out from the Atlantic Ocean to form a cute little are where beach town-meets-nightlife. Whether you're here for work, a wedding, or a visit to nana, these places to eat and drink get the locals' seal of approval. 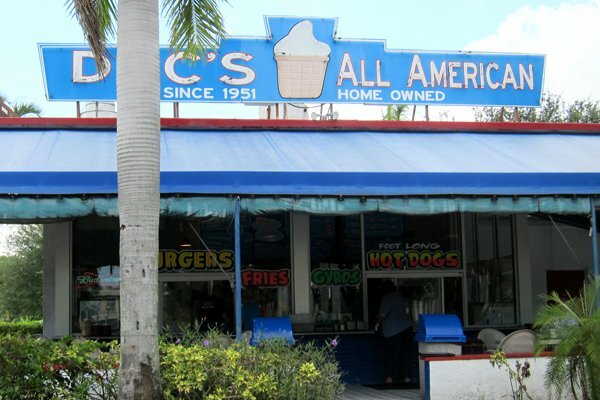 A burger stand throwback, this local joint has been in Delray since 1951. There's only outdoor seating and one menu, on the wall above the fryer. But the thin-patty hamburgers, cartoned fries, and chocolate shell-dipped soft serve cones are the Mecca of any beach town. And this might be the one place in Florida where you won't see a tourist. The best thing about this place is that if you're playing hooky and someone calls to ask where you are, you can answer honestly, "I'm at the Office." The theme is a retro, all-American office of yesteryear, but the kitsch actually feels fresh. The restaurant, with its indoor-outdoor wrap-around bar, pony-hide chairs, and top-volume conversation, always feels like happy hour. Everything on the glammed-Americana menu of burgers and meatloaf and ribs and fried chicken is good and quirky. Do not leave without trying lobster tacos, fried green tomatoes, blue crab burger with shoestring fries, and the best red velvet cupcake on any side of the Mason-Dixon line. Come for a fun, loud dinner or a lunch worth leaving the office for. The converted house is just a block from Atlantic Avenue, but feels like it's miles away. Every room is a separate dining room, the living room in the bar is often partially filled with a live band, and the tables spill out into the picket-fenced lawn, replete with torchlight under a huge banyan tree. 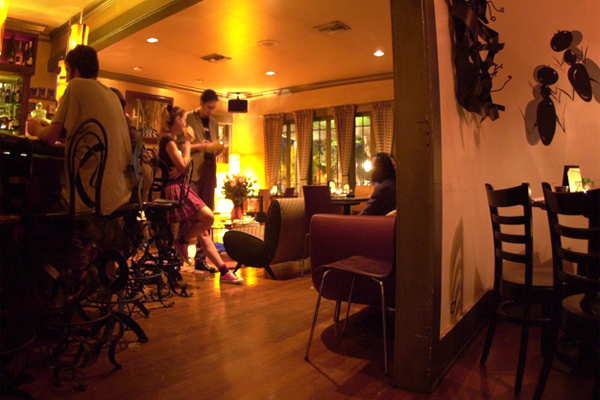 It's perfect for cocktails or a quirky-trendy dinner. A must-have is the tuna tartare. 32 East Atlantic Ave.; +1-5612767868 Long the where-to-go-after-graduation destination, 32 East is still the elegant treat of Delray Beach. With big round tables perfect for parties, a constantly changing menu, and a sleek, cozy, if somewhat typical interior, you will always feel like dinner was an occasion. The menu changes, but that Caesar salad is always there and never disappoints. 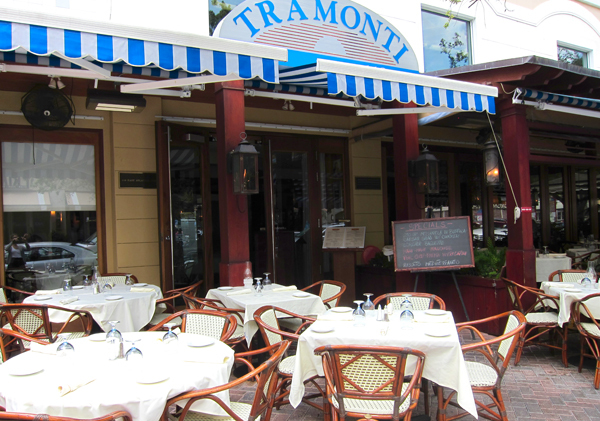 White tablecloths and red sauce at Tramonti. It's where the snowbirds flock, but even that can be forgiven at this Italian hotspot that overflows in the winter and is vacant in the summer. The Italian-American effusion makes you feel like you're on Mulberry Street in Little Italy (or what it used to be), while the cacophony makes you feel like you're in for a big night. The meatball appetizer is a must, as is capellini alla sassi. It's all Italian larger than life. Especially those meatballs.